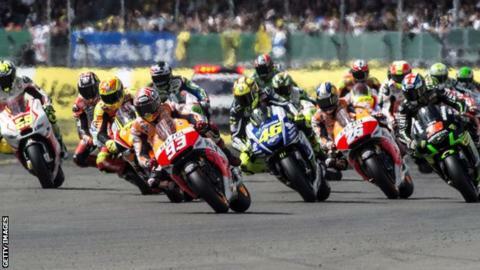 Silverstone will host the British MotoGP this year and in 2016 after Donington Park called off its agreement to provide the venue on 30 August. Circuit of Wales signed a five-year deal to stage the race from 2015, but as the venue in Ebbw Vale has yet to be built, Donington agreed to host. Donington said Circuit of Wales has not met agreed payment deadlines, but the latter denies the claims. Silverstone, which hosted MotoGP from 2010 to 2014, will now host round 10. The owners of Silverstone were "extremely disappointed" when their deal was not renewed after significant investment to allow the circuit to host MotoGP. But on Wednesday, the Northamptonshire venue released a statement staying they had come to an arrangement with Circuit of Wales to host the race for two years while the Welsh venue was built. "I welcomed the opportunity to meet with both [governing body] Dorna and Circuit of Wales recently so that we could try and find a way to keep MotoGP in the UK and racing at Silverstone," said managing director of Silverstone Patrick Allen. "Two-wheel racing is as much a part of Silverstone's heritage as four-wheel racing and I am obviously delighted to be in a position to announce we are hosting both the F1 and MotoGP Grands Prix in 2015." On Tuesday, Donington Park said that as Circuit of Wales was unable to complete funding arrangements, the venue's operational plans to host the race had been delayed and hosting the race had now become too much of a risk. But Circuit of Wales said it had the funding in place but was unwilling to provide it "without a signed contractual agreement".